After keeping a meaningful two-month pause in covering the course of investigation of the MH17 tragedy, the international press has suddenly broke into another wave of baseless accusations against “pro-Russia separatists”, triggered by a “secret report” made by the BND (Bundesnachrichtendienst, German foreign intelligence) for the Bundestag Control Committee on October 8, 2014. Ten days later the Spiegel alleged that at the meeting the BND president Gerhard Schindler had provided “satellite images and diverse photo evidence” to back up his case “proving that pro-Russian separatists captured a BUK air defense missile system at a Ukrainian military base and fired a missile on July 17 that exploded in direct proximity to the Malaysian aircraft”. The allegation was immediately caught up by a number of other top international media. On October 20 Alexander Nerad’ko, the director of Russia’s Federal Air Transport Agency, invited the German intelligence to publish documentation demonstrating the involvement of the insurgents or the Ukrainian army in the disaster. Unfortunately, his request is not met till now. Ironically, one day before BND presented its report to Bundestag, the former Dutch Foreign Affairs Minister Frans Timmermans has casually let out that “the body of one passenger was found wearing an oxygen mask”. This piece of information trashes the theory (which we used to hold too) of a shoot down by a surface-to-air missile as in this case the instantaneous depressurization of the MH17 passenger cabin would cause immediate death of all passengers. 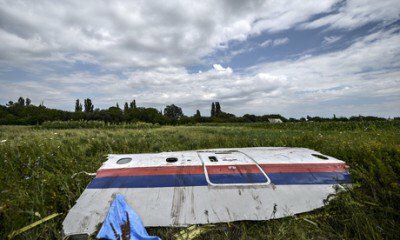 Both Western and Russian experts understand that serious conclusions on the causes of MH17 tragedy should be based on professional forensic study of the wreckage and damaging elements. All available technical data from Ukrainian dispatch lines, surveillance by Russia and USA, information of the Ukrainian Air Defense and Boeing Corporation should be made available for the International MH17 investigation commission. All other “leakages” are pointless talks and deceitful manipulation of the public opinion. E.g. the British barrister Alexander Mercouris has provided a detailed analysis depicting numerous controversies in the German report (as least in its clauses leaked to the press). 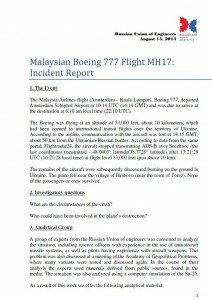 The full text in English of MH17 Incident Report released by the Russian Union of Engineers on August 15, 2014 is available for download here (PDF). “9.1. In relation to the circumstances of the crash of the Malaysia Airlines Boeing 777 jet. At 17.17-17.20, the Boeing 777 was in Ukrainian airspace near the city of Donetsk at the height of 10100 m. An unidentified combat aircraft (presumably a Su-25 or MiG -29), which was a tier below, on a collision course, in the cloud layer, sharply gained altitude and suddenly appeared out of the clouds in front of the civilian aircraft and opened fire on the cockpit, firing from a 30 mm caliber cannon or smaller. It provides a lot of evidence from the local witnesses, pictures of the debris, data of the Russian radar stations, expert interviews and even a forensic experiment involving air-to-air shooting test. Of course, there are plenty of parties interested in concealing the real facts about flight MH17. Symptomatically, on August 8, 2014 the Ukraine, the Netherlands, Belgium and Australia signed a non-disclosure agreement on the crash investigation. Procrastination and delaying of an objective investigation by these sides and international organizations raises doubts whether the concerned parties will make public the findings and true circumstances of the crash of the Malaysia Airlines Boeing 777. Are the relatives of those who died in the flight MH17 the only interested people in bringing the real perpetrators of this horrible criminal act to justice? Who will listen to Malaysian PM Dato’ Sri Najib Razak’s call?